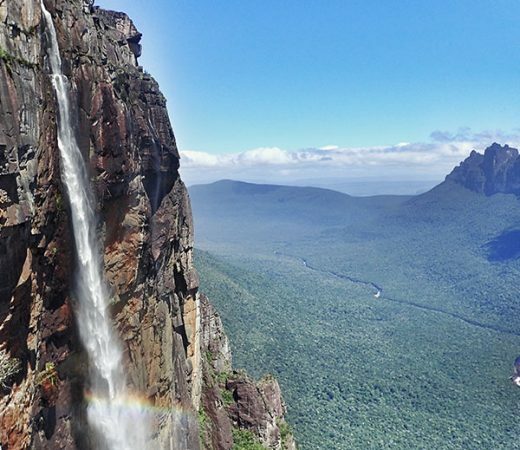 The aim of this classic expedition to Venezuela is to climb the tabletop mountain (tepui) of Auyán-tepui and to abseil down the world’s highest waterfall, Angel Falls. The 979m waterfall takes two days to rappel down over 13 abseil pitches, with out-of-this-world views over the jungle below and nearby tepuis. To get to the summit of this ancient tepui you and the team will first undertake a trek through the Canaima National Park, along the route which was charted in 1937 when American aviator and adventurer Jimmie Angel was forced to descend through the jungle on foot to reach civilisation after he crash-landed on the summit.